The Oberholtzer Foundation, Toward Magnetic North: The Oberholtzer-Magee 1912 Canoe Journey to Hudson Bay, (Jean Replinger, editor and project coordinator), Marshall, Minnesota: The Oberholtzer Foundation, 2000, 128 pp, illus., ISBN 0-9703138-0-2, $50 (US). All day the sun shone and at evening went down in a rich sunset. A clear mass of colour toning from wine at the horizon to old gold above was broken only at the top by a great hand-like cloud of gray-blue extending with outstretched fingers from the north. Gradually, all the underside of the cloud brightened into scarlet puffs and the water all round was shimmering in old gold. None of the colours were brilliant, probably because of a slight haze. A seal’s head came up in the midst of the gilded water. The eastern sky was a mass of foggy clouds, through which the moon showed at first vapoury and without light and then in a pleated reflection across the billowing water that looked like a Japanese lantern. Not till eleven o’clock after we went ashore, did it come out bright from the clouds, and even then with two halos — an inner brownish one and an outer circle of spectrum. 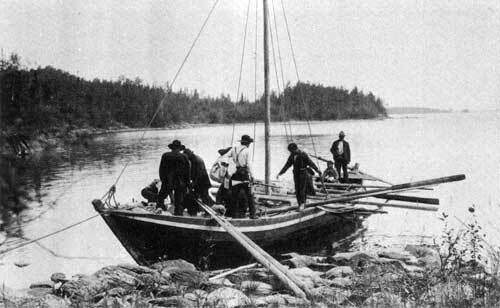 On June 26, 1912, Ernest C. Oberholtzer and Billy Magee set out, unguided, from the Pas, Manitoba, for a canoe trip which would take them north to Brochet and Neultin Lake, east along the Thiewiaza River to Hudson Bay, south by way of Churchill and York Factory, then inland up the Hayes River to finally arrive, after five months of travelling, at Gimli, Manitoba, on November 5, 1912. York boat with crew and passengers, 1912. Two canoes of the Revillon Freres Trading Company, 1912. Oberholtzer’s story has remained the stuff of legend but has never achieved its proper place in the annals of northern achievement. In the late 1940s, Sigurd Olson became acquainted with Oberholtzer when Olson joined the Quetico Superior Council as the resident ecologist. In 1947, Olson resigned his position as dean of Ely Junior College to start a new career as a writer and wilderness preservationist. Undoubtedly, Olson helped to spread the story of Oberholtzer’s northern trip. P. G. Downes mentions Oberholtzer in his chapter on Neultin Lake in his classic Sleeping Island. Downes states that “no record of this trip, an extremely laudable one, was ever published, but Oberholtzer was dimly remembered by a few of the really old residents of the country”. Calvin Rutstrum, in his 1964 guide to canoe technique, North American Canoe Country,  included the ‘Oberholtzer-Magie [sic] Journey’ in his chapter entitled “Some Significant Canoe Voyages.” Other than these brief references to Oberholtzer, and more recent research by Robert Cockburn,  the story of the Oberholtzer-Magee trip, and the wealth of associated documentation has remained virtually unknown as a source of information for northern researchers and enthusiasts alike. Nearly a century later, Toward Magnetic North: The Oberholtzer-Magee 1912 Canoe Journey to Hudson Bay, may be the first step in generating a larger appreciation of the documentation surrounding Oberholtzer’s journey through the barren lands. 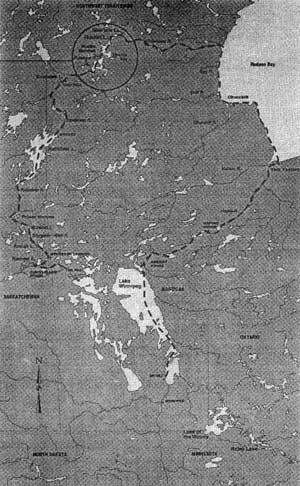 Canoe route of Ernest Oberholtzer and Billy Magee through northern Manitoba and the North West Territories. Their trip began in June of 1912 at the Pas and ended in early November of that year in Gimli. 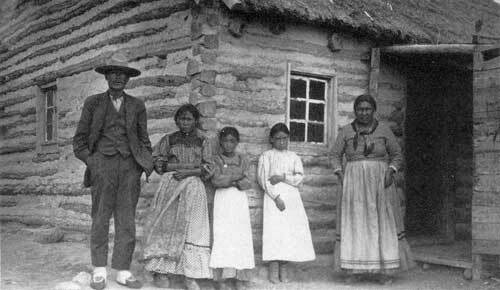 Dene family in front of their log home at Brochet, Manitoba, July, 1912. There are a number of short essays accompanying the photographs including a discussion of the 1912 trip, and another on Oberholtzer’s life following the trip including his admission into the Explorer’s Club and his work with the QueticoSuperior Council. There is also an essay discussing the relationship between Oberholtzer and Magee. Oberholtzer interviewed members of Magee’s family in an attempt to document Magee’s experience of the trip. The tapes have apparently been translated, but, unfortunately, the essay included in the book provides little information on Magee’s perspective. The final essay is a memoir by a close friend of Oberholtzer’s who returned with him, in 1963 when Oberholtzer was nearly 80, to Neultin Lake to retrieve a note he had left in a cache there in 1912. 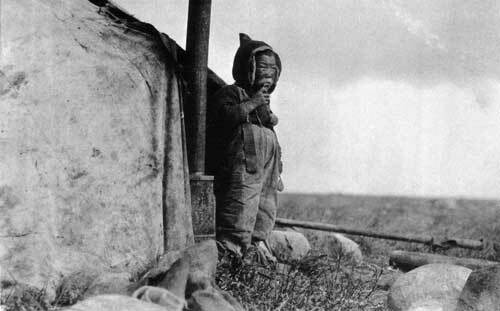 Oh-rut-yuk, a ten-year old Inuit child photographed near the mouth of the Thlewiaza Rivr, September, 1912. Toward Magnetic North contains nearly seventy images of the people and their way of life in the southern barren lands just prior to the region entering the twentieth century. The images are engaging and uncannily honest. Perhaps this is because Oberholtzer and Magee were not undertaking official work, and were ultimately dependent upon the good-will of the northern residents they encountered. Whatever the reason, the photographs are unique and should be of interest to both northern researchers and enthusiasts. 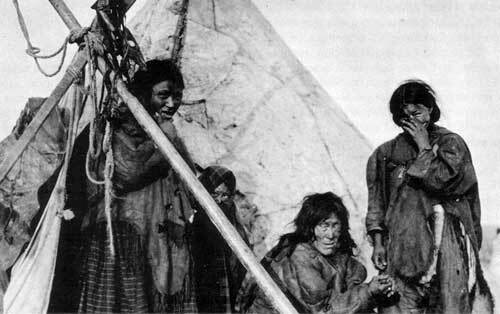 Inuit women and girls photographed at an encampment on the west coast of Hudson Bay, September, 1912. Much care was obviously taken in the reproduction and in the initial selection of the images to be reproduced in the book. Toward Magnetic North, along with the journal once it is published, will make a wonderful addition to the existing body of northern literature, documenting as it does, an extremely personal, often candid, and unromanticized experience of a world now lost to us. 1. 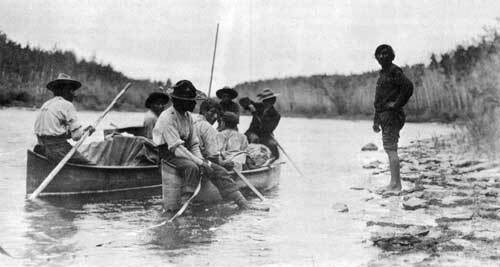 Robert Cockburn, Ober As Explorer, in Toward Magnetic North: The Oberholtzer-Magee 1912 Canoe Journey to Hudson Bay (Oberholtzer Foundation, Marshall, Minnesota, 2000). 2. As quoted in Lobsticks and Stone Cairns: Human Landmarks in the Arctic, edited by Richard C. Davis, (Calgary: University of Calgary Press, no date), p. 130. 3. R. Newell Searle, Saving Quetico-Superior: A Land Set Apart (Minnesota Historical Society Press,1977). A biography entitled Legend: The Life Journey of Wilderness Preservationist Ernest Carl Oberholtzer, by Joseph Paddock is forthcoming from the Minnesota Historical Society press. 4. P. G. Downes, Sleeping Island: The Story of One Man’s Travels in the Great Barren Lands of the Canadian North. Forward and notes by R. H. Cockburn (Western Producer Prairie Books, 1988). 5. Calvin Rutstrum, North American Canoe Country: The Classic Guide to Canoe Technique (University of Minnesota Press, 2000). 6. Robert Cockburn, “Voyage To Neulthin”. The Beaver, no. 1, January-February 1986, p. 66, and After Images of Rupert’s Land From the Journals of Ernest Oberholtzer (1912) and P. G. Downes (1939) in Rupert’s Land, A Cultural Tapestry. Edited by Richard C. Davis, (Waterloo, Canada: Wilfred Laurier University Press), 1989. 7. An illustrated edition of Oberholtzer’s 1912 journal, edited by Robert Cockburn, is forthcoming from the Minnesota Historical Society. 8. Ray Anderson, Ober As Photographer, in Toward Magentic North: The Oberholtzer-Magee 1912 Canoe Journey to Hudson Bay (Marshall, Minnesota: Oberholtzer Foundation), 2000. Toward Magnetic North: The Obeholtzer-Magee 1912 Canoe Journey to Hudson Bay can be ordered from the Oberholtzer Foundation, 300 North Hill, Marshall, Minnesota, 56258, U.S.A. Manitoba History wishes to thank the Oberholtzer Foundation for permission to use its photographs for this issue and asks readers who might have information regarding the identity of the Native woman on the cover of this issue to please contact the Foundation.